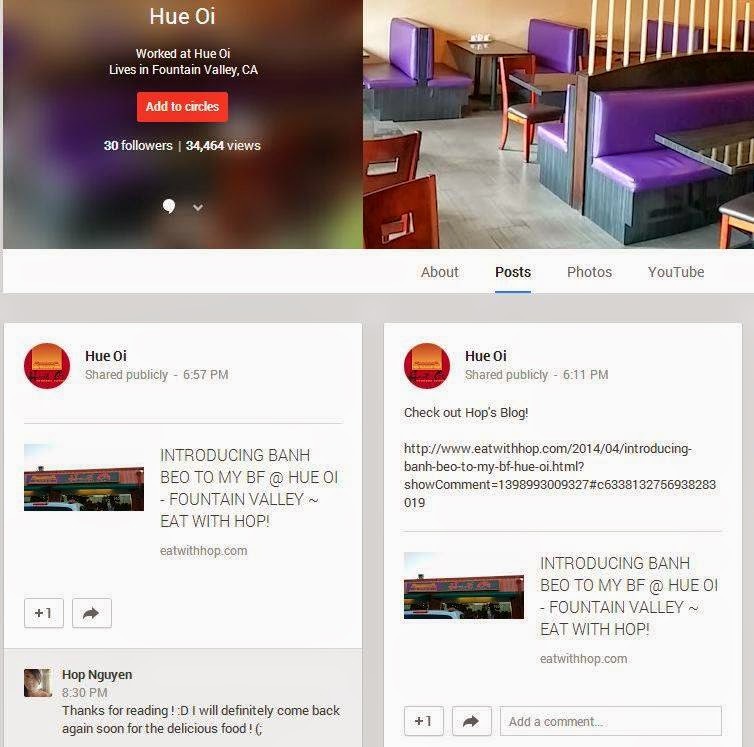 RE-SHARED BY HUE OI - FOUNTAIN VALLEY - EAT WITH HOP! WHEN THE RESTAURANT THAT I POSTED ABOUT NOTICED MY BLOG AND EVEN COMMENTED AND RE-SHARED ON GOOGLE+, I'M NOT GONNA LIE, THE LITTLE GIRL IN ME WAS SCREAAMING! This was the first time that I got noticed and officially reposted by the restaurant that I blogged about, and although it absolutely doesn't mean that I'm getting a discount or hookups, but instead, even though it's simply just recognition, I am so excited and happy about this! I will for sure get some banh beo in my belly soon when I have time from Hue Oi! BOWL OF HEAVEN RE-POSTED MY INSTAGRAM!